Home » Everest » Everest 2018 Coverage » Everest 2018: Stormy Future for Everest and the Other 8000ers? All is well on Everest, except for the normal issues associated with acclimatizing. I’m seeing a lot of talk about the weather so this post looks at what they may expect across the Himalaya and whats happening on the other peaks. Lydia, Brad, Robin and Mike D. had a good night at Camp 1, but awoke to windy conditions. It’s very windy higher up the mountain and some of the gusts are funnelling down to lower levels. Undeterred the team set out on a climb above Camp 1, tackling some steep ground that leads into the more even Western Cwm. Our expert team of Nepal Climbing Sherpas are very skilled technical climbers and their job is to ‘fix’ the lines from Camp 2 all the way up the mountain to the summit of Everest. They have been working very hard since beginning their work fixing ropes above Camp 2 on April 19th, and have now succeeded in fixing lines from the base of the Lhotse face all the way up to Camp 3. They have installed 2 lines, an ‘up’ line and a ‘down’ line for climbers. Camp 3 is now ‘open’ for climbers wishing to climb the fixed ropes up to Camp 3 to acclimatize, to secure a camp place, or to carry loads of supplies to Camp 3. 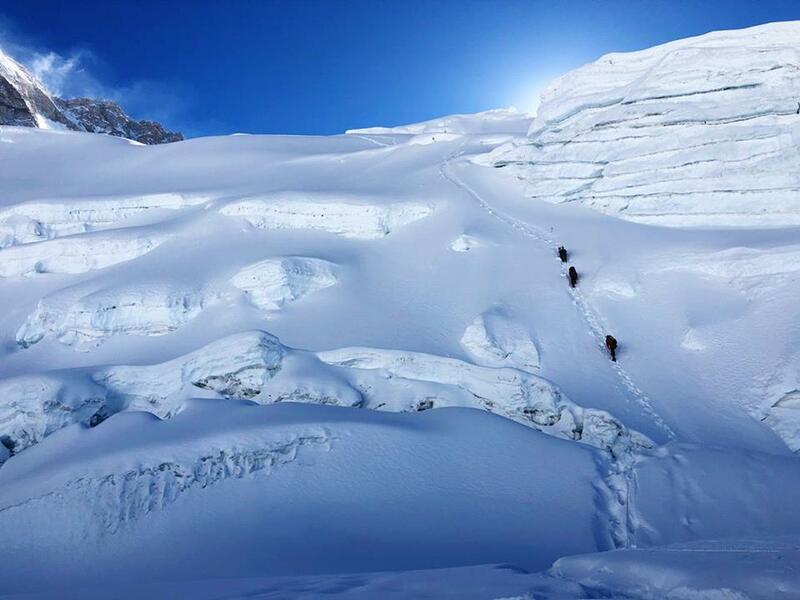 Our expert Sherpa team will rest and then continue working on the next stage to fix the ropes up towards the Yellow Band, Geneva Spur, and to the South Col known as Camp 4 on Mount Everest. We hope for good weather! Overview: A shift to snowy and colder is coming for the remainder of April into early May. We’ve seen a normal start to the climbing season, but i’m forecasting a drop in atmospheric pressure over India and the Himalaya starting this week. The jet stream weakens opening the door for moisture to flush the high peaks. Some of this can be attributed to the Madden-Julian Oscillation that swept through the Indian Ocean earlier this month. Remainder of April: Temperature decreases and precipitation increases from Dhaulagiri to Everest. But, Pakistan appears to stay significantly drier. The summit temperature on Everest bottoms out at minus 40C for a short time. With this pattern comes abnormally light summit wind. May: The month starts colder and snowier than normal with abnormally light summit wind. Then we have to look at other atmospheric counterweights like La Nina/El Nino (ENSO) for guidance. The latest data suggests a Neutral ENSO cycle by mid May. To me that suggests a rather normal weather pattern for the Himalaya. Monsoon: If a Neutral phase of ENSO holds then we’ll see a normal onset of the Monsoon over India and the Himalaya. That would also suggest normal summit wind and temperature pattern although there can be significant day to day variations. So bottom line, progress on many Himalayan peaks could slow for the next 1-2 weeks (possibly 3) as unsettled weather moves in. Then we’ll get to back to business as usual. If this forecast proves accurate its imperative the teams get as high as they can now for their acclimation without pushing to far too fast. This is always a puzzle and plays out differently each year. AND there is still a long time to go before June 1st, the usual end of the season, so certainly not time to panic. 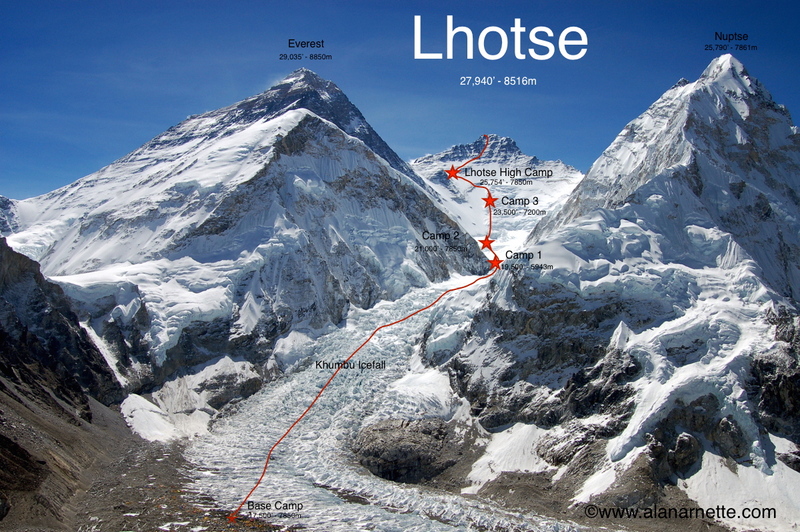 One of the “other” 8000 meter peaks is Lhotse, situated adjacent to Everest. For 2018, there have been 88 permits issued with a fair number of those being climbers seeing to nab both Lhotse and Everest in the same push. Thus far the Nepal Ministry and the Himalayan Database recognize a summit of Lhotse when starting at the Lhotse Y immediately after an Everest summit. Some feel the climber needs to start lower, perhaps Camp 2 or even base camp to make it a true summit climb, but that is a detail that mostly only those seeking summits of 14 of the 8000ers find relevant. 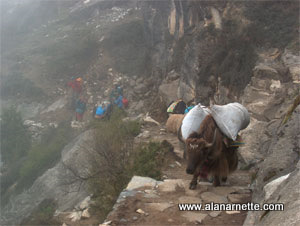 As usual, there are few teams on Cho in the spring season since most guides focus on Everest. We can expect to see Alpenglow as part of their Cho/Everest Flash combo, Kobler & Partner, perhaps Summit Climb and a couple of private teams including the Bulgarian Atanas Skatov. There has been very little snowfall for 2 months and the mountain is looking far more barren and icy than it did in 2016 making it easier to fix ropes and to climb. The jet stream is still clearly visible over the summit of Cho Oyu and huge winds blast the summit with a plume reminiscent of Everest forming each day. The team are in great shape having spent time resting and making climbing sorties to 5600 and 5900 while enjoying base camp. This BC at the lower altitude brings warm still mornings before the winds pick up like clockwork at midday. At this base named “Chinese Base Camp”, we are under the constant watchful eye of the soldiers reminding us of the control they hold over us and the Tibetans. This peak is popular with serious mountaineers as it present a real challenge to summit in the best of conditions. In spring, 2018 German Thomas Lammle is there along with a three person Chinese team, and Peruvian Richard Hidalgo. ???? Makalu Climate Climb, now go! Last year was one of misery for Kang climbers after mistake after mistake prevented their summit, including running out of ropes. This year many are back with more determination than ever. Chris Jensen Burke is amongst them as is Maya Sherpa looking to set a record for female Sherpas summiting 8000ers. She is married to Dutch guide Arnold Coster. Other climbers include Sophie Lavaud, Zdravko Dejanovic, David Liano and Csaba Varga. Maybe on a new route, Ines Papert and Luka Lindic from Slovenian-German are on Shisha. I’m covering Bulgarian Boyan Petrov while he is on Everest now but immediately after he plans to travel to Shisha and join up with Italians Mario Vielmo and Sebastiano Valentini, and Hungarian David Klein. So, we have activity on all the 8000ers located in Nepal and Tibet but no climbing at the moment I’m aware of on the five Pakistan 8000ers. Best of luck to all and ranks to Altitude Pakistan as a source for some of this post. Seriously though Alan thank you for all you do. Thank you for all your updates. I have been intrigued with mountaineering and climbing Everest for many years now. I currently have 3 young kids so now is not the time but in a few years as they get older I plan to start with Kilimanjaro, Aconcagua, Mt. Reiner, and Denali before attempting Everest. I have a lot of knowledge about it all because I have researched, read so many books and stories, and watched countless documentaries. It never gets old. I love everything about it! I thoroughly enjoy your blog and look forward to reading it everyday. Understand John. The crowds are now part of mountaineering around the world. There is still magic to found on new routes, new peaks and, imho, there is magic for that person who climbs Everest today – regardless of if they are alone or in a queue. Sometimes the pictures of crowds can look downright silly, but usually those pictures are of Sherpas ferrying gear to high camps and not a lot of members, but I totally get the argument that crowds are crowds. I’m just saying that sometimes magic is a unique perceptive of one person and that person is the only one to say if it is there or not. Thanks for your comment. Indeed. Thank You for your precious insight, Alan. You’re a huge inspiration! Why there are so few attempts in the summer season? Storms and precipitation? I don’t want to sound rude and I respect all the real heroes trying to summit, but, for me, the overcrowded missions during this season still part of the magic and beauty of the mountains. Thanks in advance, for everything. Hi John, Yeah, all about the monsoon that bring heavy snow to the Himalaya in summer.There has been a handful of Everest summits from mid June, July and August.